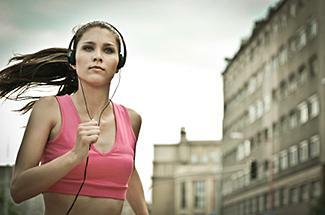 Training to run a 10K is a great way to get in shape. By setting a goal and working towards it, you may discover you are extremely motivated to exercise. With the right plan, anyone who is in good health can train for and participate in this 6.2-mile race. Make sure you are physically capable of participating in a 10K race before you start to train. This is especially important if you are sedentary or have health issues. Schedule an appointment with your doctor to get the go ahead to train. Be sure your race schedule is realistic. If you are extremely sedentary, then you will want to plan for a race that is about three to four months in the future or possibly longer. If you already exercise, then you can probably plan for a race about six to eight weeks in the future. Visit a store that sells high-quality athletic equipment and get fitted for a pair of running shoes that work with your particular stride mechanics. Find clothing conducive to distance running, including training gear in technical fabrics that wick away moisture and socks that don't chafe. If you are brand new to running or you've been extremely sedentary up until now, you probably will need to walk before you run. This will help you gain muscular endurance in your legs, as well as develop the tendon and ligament strength necessary to protect your joints once you do start running distances. You need to work your way up to being able to run about 1.5 miles (about 30 minutes) non-stop before you begin the intermediate training plan for a 10K run. 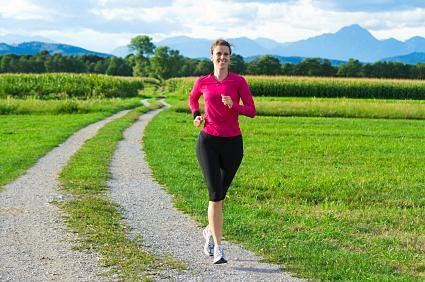 Use the beginner program to get you up to 1.5 miles. Warm up for five minutes before every workout by engaging in light activity. Cool down and stretch after each workout. Warm up with five to 10 minutes of light walking. Walk at a comfortable pace for five minutes. Repeat the walk-jog cycle three times. Cool down with light walking for five to 10 minutes. Engage in three sessions with a day of rest between each. Warm up for five to 10 minutes. Walk at a comfortable pace for four minutes. Repeat walk-jog cycle for three times. Cool down for five to 10 minutes. Walk at a comfortable pace for three minutes. Repeat walk-jog cycle three times. Walk at a comfortable pace for two minutes. Walk at a comfortable pace for one minute. Repeat jog-walk cycle three times. Cool down five to 10 minutes. Once you can run the 30 minutes nonstop, it's time to begin training for your 10K, which is 6.2 miles. Train four days per week for the first four weeks. Starting in week five, trade one of your three rest days for a cross training day where you bicycle, swim, or perform some other activity. Rest at least two days per week. Do not skip rest. Train on terrain that has some hills, since many 10Ks have a big hill somewhere in the race. Go at a pace that is comfortable for you. For your first race, the goal is to make the entire 10K without worrying about your time. Always warm up for five to 10 minutes, cool down, and stretch with each workout. Day one - Run one and a half miles. Day three - Run one and a half miles. Day five - Run two miles. 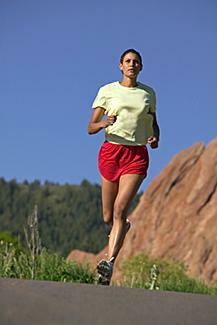 Day seven - Engage in a light run or a combination walk/run for about 30 minutes. Day one - Run two miles. Day three - Run two miles. Day five - Run two and a half miles. Day one - Run two and a half miles. Day three - Run two and a half miles. Day five - Run three miles. Day seven - Engage in a light run for about 30 minutes. Day one - Run three miles. Day three - Run three miles. Day four - Cross train, 30 minutes or more. Day five - Run four miles. Day seven - Engage in a light run for about 40 minutes. Day one - Run three and a half miles. Day four - Cross train, 45 minutes. Day five - Run four and a half miles. Day seven - Engage in a light run for about 45 minutes. Day one - Run four miles. Day three - Run three and a half miles. Day five - Run five miles. Day one - Run four and a half miles. Day three - Run four miles. Day five - Run five and a half miles. Day seven - Engage in a light run for about 50 minutes. Day one - Run five miles. Day four - Cross train, 45-60 minutes. Day five - Run six miles. Day seven - Engage in a light run for about 60 minutes. Continue to follow the week eight-plan until race week. Then, once you're in the race, find a comfortable pace and enjoy. By following this eight- or 16-week plan, you'll meet your goal of running a 10K in no time.